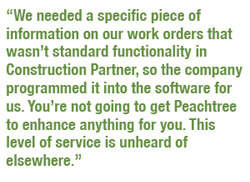 For this leading Texas-based commercial roofing firm with 60-70 employees and $10M in annual revenues, Peachtree by Sage accounting software wasn’t keeping up with its construction specific financial management needs. Payroll issues were the biggest problem. “Our roofer burden is considerably higher than our sheet metal burden, and Peachtree couldn’t differentiate between the two,” explains Accounting Manager Susan P. “Our employees frequently move between worker’s comp codes and our software couldn’t track the differences or accurately accrue the burden.” As a result, Susan was spending several hours each week tracking payroll burdens manually. solution designed to handle complex construction accounting needs, like payroll, service management, equipment management, purchasing and inventory. After an easy installation and just two days of on-site training, their accounting team was up and running. Once installed, Construction Partner provided automated solutions to the roofing company's manual accounting issues. Different worker’s comp codes are now automatically selected during Payroll timecard entry based on the work performed and burdens are calculated automatically. “We don’t have to do anything by hand,” states Susan. While solving their payroll and service management issues has saved hours of time, additional benefits from Construction Partner have been realized across the organization. Purchasing Controls: Construction Partner’s Purchasing module has helped the roofing contractor’s purchasing agent gain better control over invoice discrepancies. All material purchases are entered into the system and a purchase order is created. If the amount billed by a vendor doesn’t match the purchase order, it is investigated prior to payment. This eliminates possible overpayments. with Construction Partner, a software developer known for this same trait. rather than someplace overseas. And she explains how Construction Partner helped her company out in a big way.